Although I’ve visited the Sacre Coeur several times, as well as a few other cafés in Montmartre, I’ve realised that I barely know the area at all. Today I set out to remedy this. Instead of getting off the metro at Anvers, I left at Pigalle and snaked my way up the hill of cobble-stoned streets. 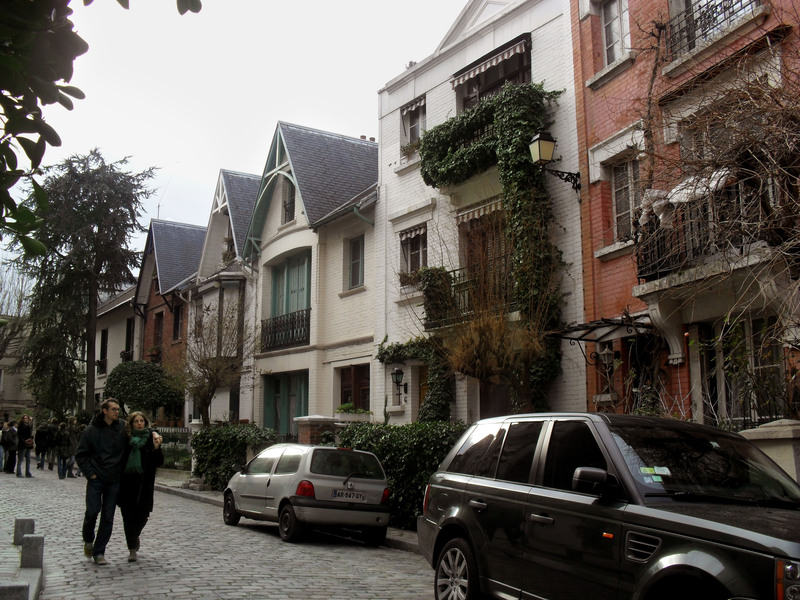 Although Montmartre became a part of Paris in 1860, the village retained its character despite Haussman’s renovations. From the 1880s artists gravitated to the area, giving it the bohemian atmosphere for which it is still known. Though, on a Sunday, everything was very calm. People sat under leafless trees on park benches, in tiny parks squeezed into street corners. They posed for photos under iron lamp posts on flight after flight of stone stairs, and they slowly perused café and restaurant menus before choosing whether or not to sit down for a drink. Street performer. That’s a vase containing a goldfish on his head! The streets were filled with boutiques, bars and bakeries, many of the glass-front shops dark and empty. 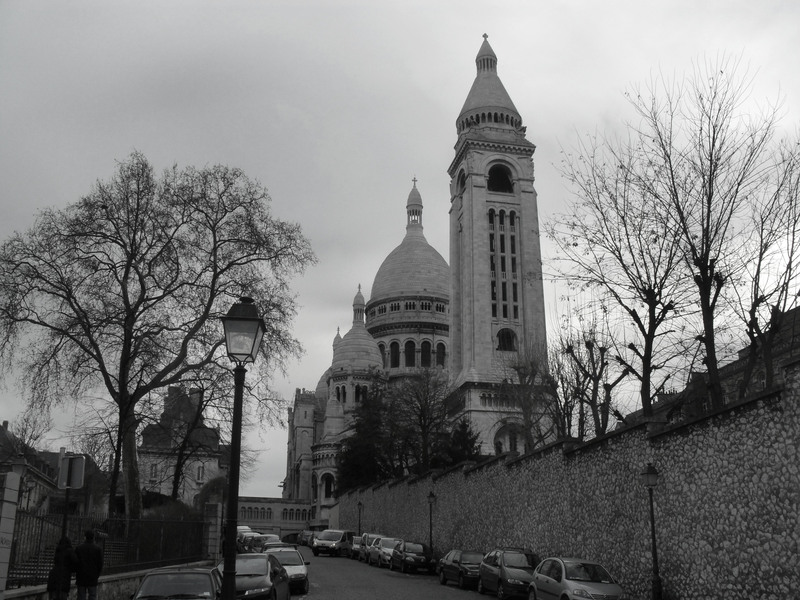 However, the energy changed as my path wound closer to the Sacre Coeur. The crowds increased and soon the shops were all dedicated to souvenirs. Suddenly the quartier was alive with street artists – not the usual hip-hop dancers you see around Anvers, but a swing band, a cellist and a tap-dancing, balloon-animal maker. The latter was the most impressive – he would select a child in the crowd and make him or her a balloon animal while tapping away, balancing a vase filled with water on his head. And there were three live goldfish in the case. 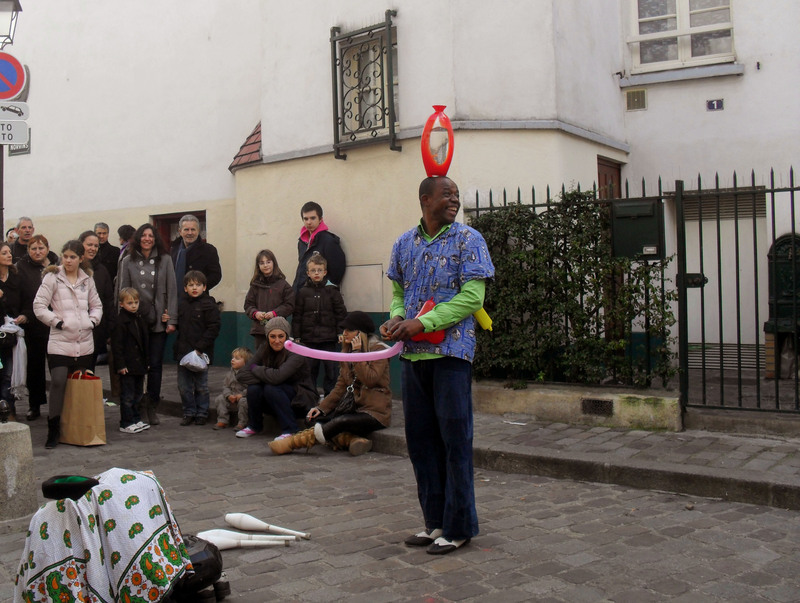 He was performing on the corner of Place du Tertre, a square bordered by restaurants and filled with artists selling their wares. 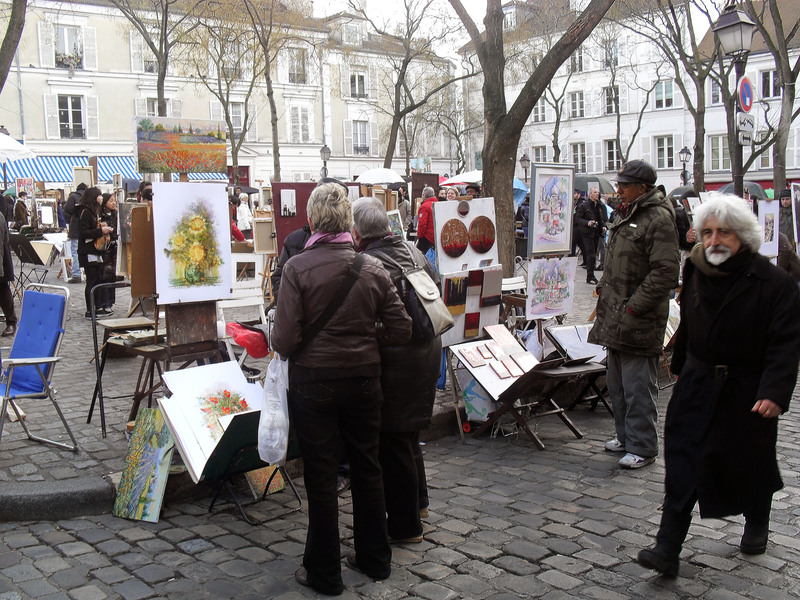 One half of the square had painters with easels displaying images of Paris for sale, and the other half of the square had portraitists who were sketching greyscale images of tourists – there must have been twenty or thirty of them. I continued to the Sacre Coeur, where more artists were standing with sketch paper on clipboards, drawing people while standing. I considered going to the hill in front of the Sacre Coeur to see what entertainment was there (past examples have included hip-hop dancers, jugglers and a man walking down the hill on his hands), but walked behind it instead. I was shocked to discover a completely different world. The crowds ceased abruptly, and I was in a residential area. 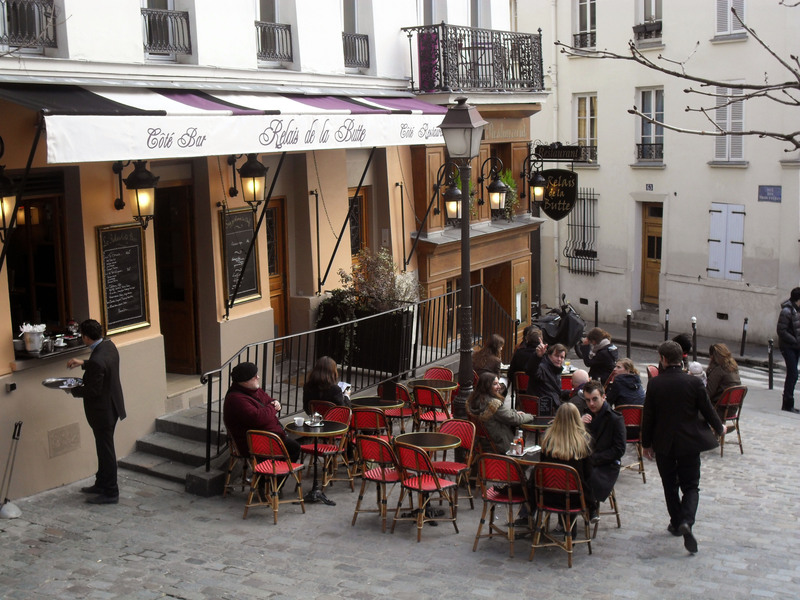 It was still Montmartre, with its stairs, lanterns, cobble-stones, park benches and architecture, but it was quiet. 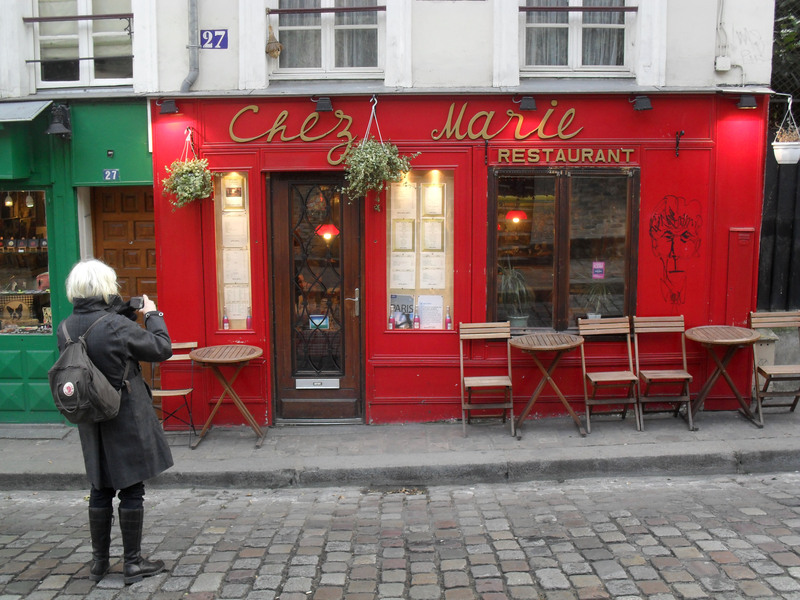 I strolled down Rue Saint Vincent and only saw two couples and an old woman walking a white poodle wearing a red vest. From here I walked to the mansion and tree-lined Avenue Junot and turned down Villa Léandre. Villa Léandre is reputedly one of the most expensive streets in Paris, with colourful houses and gardens lining the street. 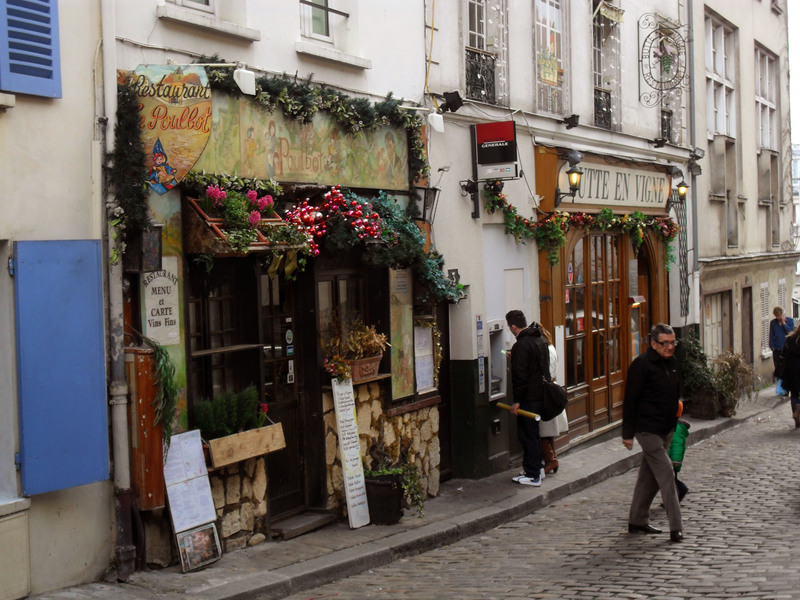 As I left Villa Léandre I saw a sign pointing to Place du Tertre and a small group of tourists coming my way, and realised that I was heading back to the beaten track. 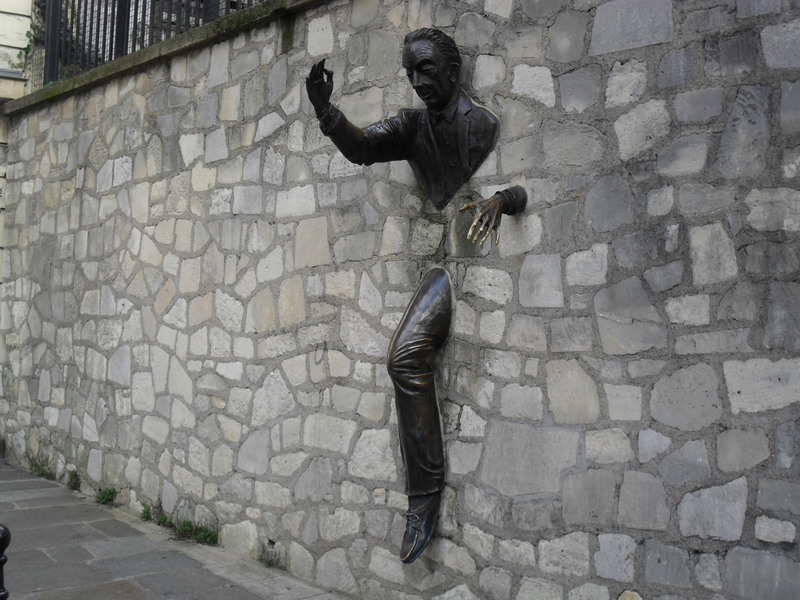 I followed the sign, passing a sculpture of a man coming through a wall. This sculpture is of the protagonist of French writer Marcel Aymé’s short story Le Passe Murielle – at 42, the character Dutilleul discovers that he can “pass through walls with perfect ease”. This talent drives Dutilleul to sinister pursuits until he is trapped in a wall on Rue Norvins in Montmartre, where we can see him today. 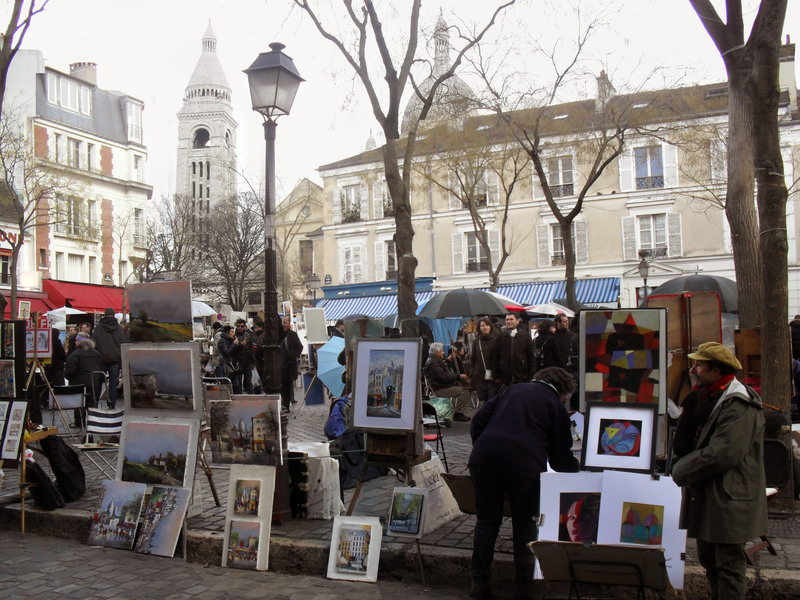 I returned to Place du Tertre, and window-shopped my way along the beaten track back to the metro. After an hour of walking, I still don’t know Montmartre very well, but I think we’re becoming better acquainted.